Crochet yourself this cute summer tote from plarn. What is plarn? Well if you haven’t heard the term yet, it refers to the yarn created from recycled plastic bags. I believe Sonnets and Stitches from Crochetville.org was the first to coin the term. Here is my link to a picture tutorial on how to make plarn. So check it out and recycle all those plastic bags into something of beauty. It’s truly trash to treasure at this website! Want to make your plastic bags recyclable? Want to bring your own bag to the grocery store? Want to have your own green eco-friendly shopping bag? 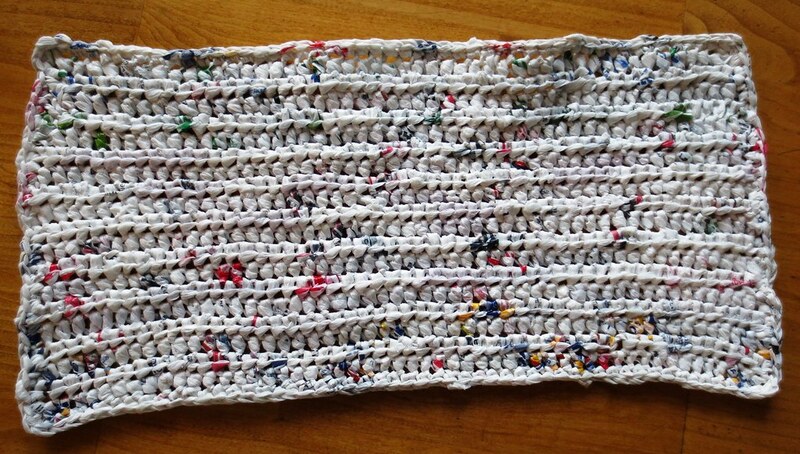 Well crochet or knit those plastic bags into a recycled grocery tote bag. Here is the link for the tutorial for creating plastic bag yarn. Recently this plastic bag yarn has earned the nickname of ‘plarn’ to describe it. I love the term and hope it catches on. Crafting tote bags has become very popular. It’s a wonderful way to save our trees and our landfills. I have several free crochet and knitted patterns available at the patterns links page here so check out your options and make yourself a reusable grocery tote bag! This bag features a roomy expandable heavy bottom, an open mesh upper tote and a wide sling strap handle. 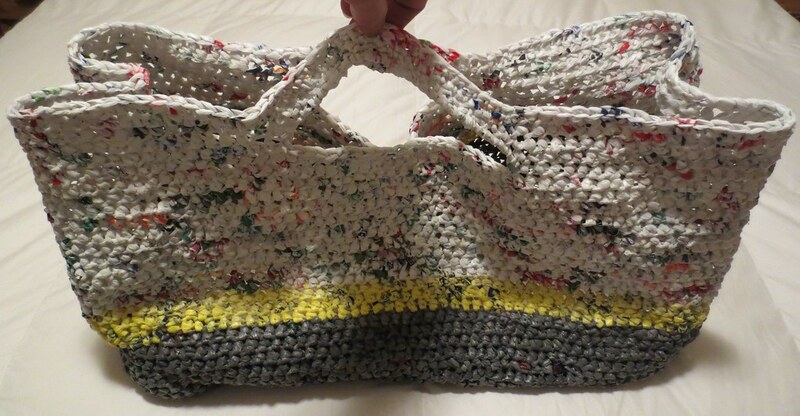 If you are a crocheter, below is the free pattern to create this recycled tote for your next shopping trip. 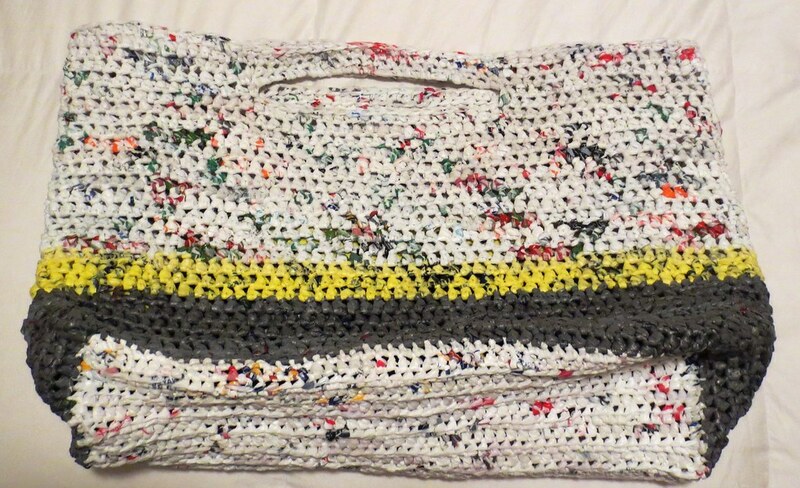 Materials needed:	One large ball of plastic bags cut into strips and interlocked to create a ball of plarn yarn — Approx. 56 bags. This crocheted Eco tote features a granny square motif and recycled materials to create an unique look. I used yellow and grey plastic grocery bags, vcr vhs tape, and white plastic retail bags in this project. My goal in creating this Eco tote was to crochet a bag that would be strong enough to use as a book bag and could be used for an everyday carry tote. I also crocheted this bag as a Crochet-a-Long (CAL) at one of my favorite craft website forums Crochetville. My Eco tote measurements are 12″ wide, 13″ long, 1-1/2″ deep at sides with strap that is 1-1/4″ wide and 28″ long. I have included some closeup pictures below to help you in this project. I must warn you that I did have problems keeping my tote bag square. I believe it’s because of the different materials that I used and because the plastic tends to stretch a bit during crocheting. Size: Approx. 12″ square bag with strap that is 1-1/4 inches wide and 28 inches long. Hook: N (9 mm) metal crochet hook used in this Motif pattern.